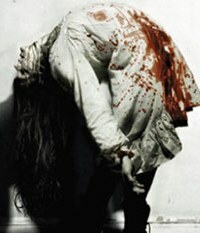 It was announced yesterday in the UK that the local Advertising Standards Authority -- the bureaucracy apparently in charge of making sure impressionable young British yobs don't grow up to be wholly corrupt, irretrievably violent and oversexed yobs -- has banned the final poster for the horror film The Last Exorcism after reported numerous complaints from parents. But a glimpse at the American poster suggests it's nothing a quick dab of Photoshop can't fix. The ASA said most complainants found the images promoting the 15-rated film offensive, distressing and unsuitable for public display because the girl appeared to have suffered a sexual assault. The images appeared on buses and in the Cineworld's cinema chain's Unlimited film magazine. There was concern that the posters were likely to upset children because some posters were placed near schools and because the magazine was freely available. 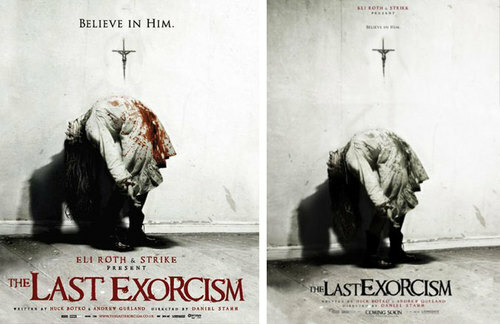 I don't know what part of the tagline "Believe in Him," the crucifix, and the title The Last Exorcism allows for much ambiguity in terms of who and what the poster's subject is dealing with, but, well, OK. It's funny, though, because as far as I know, this never came up with the MPAA in the States, probably because the "Desaturate" function just seemed too obvious when dealing with the ratings board here. And all this time I thought the girl had just needed some Tide and a bath. Disturbing! Poor thing needs a maxi this month.